Daniel Ricciardo will start seventh at the Chinese Grand Prix on Sunday. 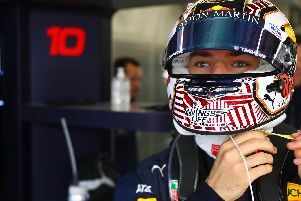 After a fairly routine session for the Australian, Ricciardo set a time of 1:37.540 as the pace of the RB11 sadly lacked behind Mercedes, Ferrari and Williams. Lewis Hamilton will start from pole position, ahead of team-mate Nico Rosberg, with Malaysian GP winner Sebastian Vettel in third. Ricciardo’s Red Bull Racing team-mate Daniil Kvyat had a much harder time of things, and failed to make the top 10 shoot-out. Having clung on in Q1 by the skin of his teeth, Kvyat struggled to make an impact and with his one run in the second session, could only qualify 12th for tomorrow’s race.